This time of year, many are looking for treats made from real, whole foods. Thus, I give you our homemade hot chocolate. This winter, A. 's been making this just about every day. There's no turning down the steaming cups she hands out! Whisk all together over medium heat. Stir continuously until warmed to desired temperature. Top with whipped cream or a dusting of cocoa powder. Enjoy! This post featured in 33 Warming & Nourishing Fall Sippers. Great minds think alike. 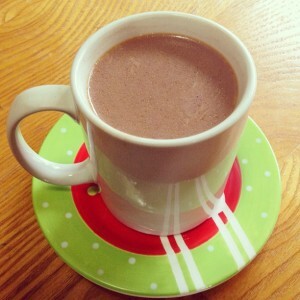 I posted our hot chocolate recipe on my personal blog just the other day. Now I think we’ll have to make some more today. Thanks, Wardee! Now I’ll have to try adding a pinch of salt. Must be in the air. I posted a mocha recipe today. Looking forward to trying both your recipe and mine with honey. My girls are dairy free right now so we make it with full fat coconut milk!! So good!! If you can find frozen coconut milk it is the best.. no preservatives and no can! Jenetta — I agree, it is delicious with coconut milk! I have never heard of frozen coconut milk though. Where do you get that? What brand? This looks absolutely delicious! Could I use almond or coconut milk? (My 13-month-old breastfed baby is dairy free right now–so that means mommy is dairy-free, too!) Can’t wait to try it! Thank you! Oh thank you! I should have read the comments first!! This sounds so good, my kids are going to love it on christmas day. Found your blog today when you were also on the Jimmie Moore list. Glad he mentioned it, have added it to my RSS reader! Sounds good. I make something like this, but use half real coffee. I also replace some of the milk with heavy cream after heating it all, but no sweetener. A dash of cinnamon and a generous amount of vanilla do it for me. I also add a pinch of salt – for some reason, it makes a difference. The coconut milk sounds wonderful – might have to try that! Wardee, please help me understand the chocolate dilemma. Is it ok to eat chocolate or not? The Nourishing Traditions book tells you to avoid it. All her recipes use carob… What do you think? We looooove chocolate but are willing to give it up, just like coffee.